The Lower Mule Canyon Ruins are located in the Comb Wash area west of Blanding, Utah. The ruins consist of 2 cliff dwellings and a separate granary that are spread out along a southwest facing cliff all within about a quarter mile of each other. The location of the ruins is in the lower end of Mule Canyon a short distance from where the mouth of the canyon meets Comb Wash. There are a couple of ways to get into the lower end of Mule Canyon. 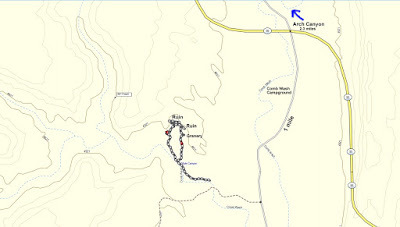 One is to hike across the hill from the Comb Wash Campground and the other is via a 4x4 road that branches off of the Comb Wash Road. To get there drive about 4 miles south from Blanding on Highway 191 and turn right on Highway 95 toward Natural Bridges National Monument. 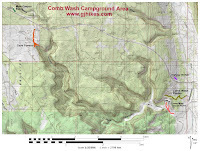 Follow Highway 95 for 14.3 miles and turn left into Comb Wash onto County Road 235. 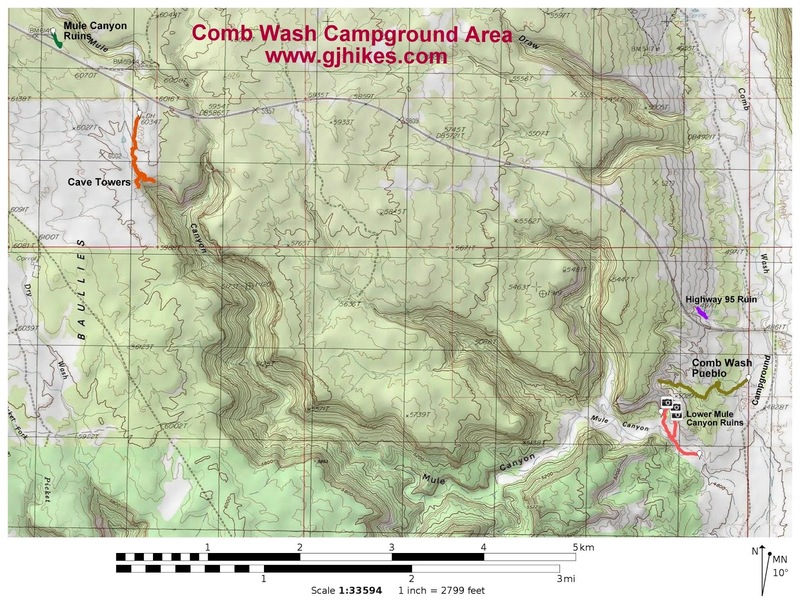 Drive past the campground measuring 1 mile from Highway 95. Just past the 0.7 mile point the road crosses a wash where a high clearance vehicle might be necessary. After another 3-4 tenths of a mile there is a dirt road that branches off on the right that leads into Mule Canyon. If you have a suitable vehicle you can drive to the end of the road and cut off about a half mile of hiking. Hiking over from the campground is a good option where you can see a tower ruin and the rubble pile of a large pueblo along the way. All of the ruins can be seen by hiking a loop that begins either at the end of the 4x4 road or a short distance from the end. For this post we are beginning at the first trail marker a short distance from the end of the road. As you can see from the picture the point where the trail begins is well marked. The trail itself on the other hand doesn't get enough use to be all that obvious. Basically you just cut across the sagebrush flat to the left heading toward the point of the cliff. Just around the corner of the cliff there is a well preserved granary that was built within a small overhang. A short distance further a cliff dwelling can be seen that is higher up. You will want to climb up there and check it out and to see a nice panel of petroglyphs. It also makes for an easy route to the next ruin. To get up there you can either make use of the moki holes that they carved into the sandrock or do a slickrock friction climb to the right of these where the cliff isn't quite as steep. We opted for the slickrock friction route. The ruin is strung out along the bench below the sloping face of the cliff where it catches plenty of sunlight with all of its radiating heat. From this ruin it is an easy hike along the bench. After passing by the large boulder look for a petroglyph panel on the smooth face of the cliff on the right. The petroglyphs were etched with wide lines and still show up pretty well. The next ruin is in relatively good shape. Be sure not to enter any of the rooms or granaries so that they can remain that way. There is one large granary that looks to be in near perfect condition. You might also notice several holes that were dug out in the sandstone. Whether they were used for grinding or to hold pots for catching rain water would take further study. There are two large boulders that look like they were used as metates to grind corn but neither is laying flat anymore. The impression is that they must have slipped from their original positions. From the last ruin it is only a short distance over to the end of the road which you can follow back to wherever you started at. 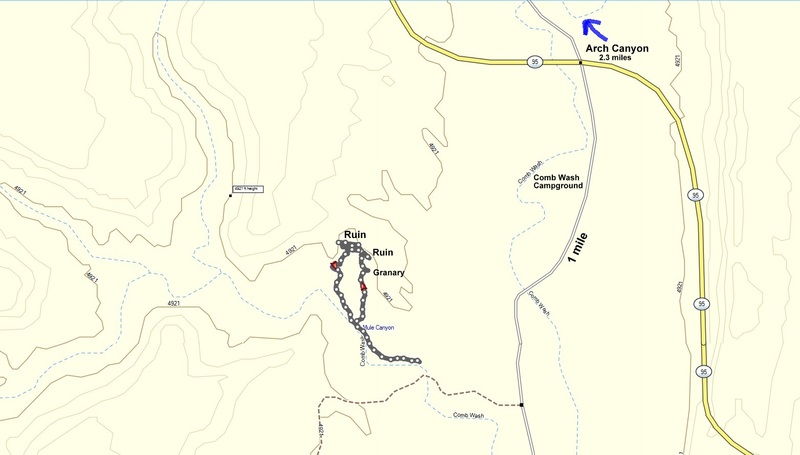 There is also the option to hike further into Mule Canyon. We hiked in for about 1 mile and never came to anything of much interest. The hiking is a little rough with difficult route finding in places. If you stay in the main branch of the canyon you should eventually be able to come out below the Mule Canyon Cave Towers where there are several more cliff dwellings. Measuring the distance on the map it would be over 5 miles one-way from here to the cave below Cave Towers. For this post we parked along the jeep road leading into Mule Canyon. We could have driven all the way but then we would have ended up with more brush scratches on the side of our truck. We have also hiked into the canyon beginning at the campground. That route is okay but the trail kind of disappears where you drop into Mule Canyon and you have to find your way through tall brush to get to the road. It isn't all that bad though. The Lower Mule Canyon Ruins are a good something to do especially if you are staying in the campground. At present the camping is free and there are a couple of toilets. There are also quite a few primitive campsites in the lower end of Mule Canyon that you can drive up to as well as along the Comb Wash Road. If you would like to see it for yourself then all you have to do is 'Take a hike'.